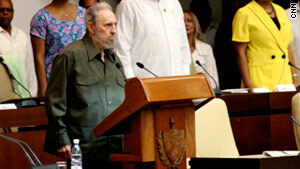 Fidel Castro denounces an "inevitable" invasion of Libya in an essay Thursday. Havana, Cuba (CNN) -- Cuba's former President Fidel Castro denounced on Thursday what he says is the inevitable U.S.-backed invasion of Libya by NATO to get its hands on that country's oil. In an essay called "NATO's Inevitable War" and published in Cuban state media, Castro wrote that the United States and NATO "couldn't help but take advantage of the internal conflict that has arisen in Libya to promote military intervention," expressing concern because Libya is a major oil producer. Castro also condemned what he called "a colossal campaign of lies" spread by the Western media about Libya. He has repeatedly denounced plans to invade Libya but has said it is too soon to pass judgment on his longtime ally Moammar Gadhafi.